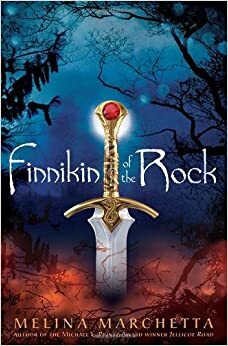 Finnikin of the Rock, by Melina Marchetta, is one of those books that so many people recommended to me. Or, I should say, Melina Marchetta is an author that many people love, and I have never read her. But I've had Finnikin of the Rock on my Kindle forever, and I finally read it! The book reminded me of Guy Gavriel Kay's Tigana. It's a fantasy novel about displaced people trying to find their way home. I really liked that part of the story - all these people, separated for years, finding each other and joining in The Quest, and trying to get home. Unfortunately, there was also a massively inconsistent romance in the book that really annoyed me. Sometimes Finnikin and this at-first-mute but then really talkative religious-novice (supposedly) Evanjalin are BFF, and sometimes they hate each other, and sometimes they love each other, and sometimes they want other people, and it was all just TOO MUCH for me. Also, I thought Evanjalin was all over the place, character-wise. So I didn't finish this one. I did finish Karen Thompson Walker's The Age of Miracles, but that's really only because I was reading it on audiobook and I figured, since the book is about the apocalypse, that I should get to the end and see what happened to the world. In this dystopian young adult novel, the earth's rotation is slowing. The days are growing longer, the crops aren't growing at all, and Julia is growing up. She's 11 years old, her best friend is moving away, and she has a big crush on a sk8r boi. It's hard to be an adolescent at the best of times, and it's probably even harder to be one when the world is ending. Julia goes through quite a bit of heavy stuff, but she also goes through life as a pre-teen. She loses her best friend, she faces her parents' crumbling marriage, she tries to just be normal. I liked the way Walker mixed the extraordinary with the ordinary to show what life could really be like in such a situation - people just keep trucking on. That said, the book didn't really succeed for me. Julia sometimes was far too deep for an 11-year-old. And this was a very quiet book in many ways, which isn't exactly what I was expecting from a novel about the end of the world. I appreciate that Walker didn't fill it with massive wars or thieving hordes, but I also wish she had done just a little bit more. I felt EXACTLY the same way about Age of Miracles. It was definitely not what I expected, and what it WAS--an internally-focused coming-of-age story about people who just sort of sadly plough forward even though the world is literally coming to an end--is just insanely far from being the book for me. I also didn't like Finnikin at first, but for very different reasons. I found it incredibly confusing, and hard to keep the characters straight and figure out the unspoken subtext and motivations (honestly, similar to my reaction to King Hereafter, which you loved). I started it about four times before sticking it out (which I did because it was SO highly recommended) and by the end, I had pushed through my confusion and loved it. I see what you mean by Evanjalin being hard to get a handle on, and some of the characters behave in ways that seem inconsistent. But I feel like once I got past the hump (which was a huge long hump, BTW, like 150 pages or something), it all felt a lot more like human variability, rather than inconsistent character development. The funny thing is that I've never liked another Melina Marchetta book; everyone loves them so much and I find them kind of confusing and overwrought. I thought the second book sounded familiar - I added it to my to-read list a while ago, when I was a little more gung-ho about everything apocalyptic. But the specific things that you say don't work for you are the type of things that would bother me, so I went ahead and removed it (and also I'm less into apocalyptic books now). Ahahaha, sorryyyyy! I will say that two things: 1) that I did not love Finnikin of the Rock the first time I read it; and 2) that you are not the only one of my reading pals for whom Melina Marchetta has done nothing. She's a tricky author to recommend! I know she is not everybody's cup of tea but I am not yet perfect at predicting whose cup of tea she will be.